LOS ALAMOS, New Mexico, Sept. 27, 2010 — The ChemCam instrument has completed the first short leg of its long trip to Mars, arriving at the Jet Propulsion Laboratory from Los Alamos National Laboratory for installation aboard the next Mars rover, due to launch in 2011. 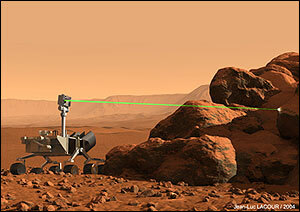 The NASA Mars Science Laboratory Project's rover, Curiosity, will carry the newly delivered laser instrument to reveal which elements are present in Mars’ rocks and soils up to 7 meters (23 feet) away from the rover. By firing intense pulses of laser light at potentially distant targets, the ChemCam instrument uses a technique called laser-induced breakdown spectroscopy (LIBS), to measure the chemical content of the target samples. The laser beam zaps a pinhead-sized area on the target, vaporizing it. A spectral analyzer then peers closely at the flash of light from the vaporized sample. Atoms ablated in ionized states emit light and each sample yields spectral emissions at unique wavelengths revealing the elements present in the material. Like fingerprints, the emission line wavelengths can be matched to a library of known chemical compounds. Even dust-covered rocks will reveal their inner secrets to the ChemCam interrogation. On such samples the laser first cleans away the dust or weathering coatings prior to performing the rock analysis. There is no need to drive the rover to within reach of the target rock. ChemCam is the first instrument of its kind. “We brought together a lot of new ideas to make this instrument a reality. It has been exciting to see this invention come together,” said Roger Wiens, the instrument’s principal investigator, from Los Alamos. “ChemCam will act as a geochemical observatory, providing composition data to understand if Mars was, is, or will be a habitable world. It will also help the rover team pick the most promising targets on which to use the rover’s other instruments,” added Sylvestre Maurice, the French lead for the instrument. Wiens and Maurice started working together ten years ago on the early precursor to the current ChemCam instrument. A sizeable team of US and French scientists will work together under their leadership to operate the instrument on Mars and interpret the data. The Curiosity rover, ChemCam’s host vehicle, is by far the biggest and most capable robot ever destined for Mars. 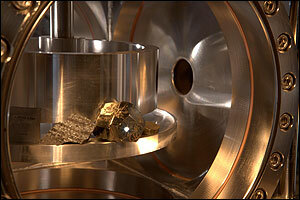 It is nuclear powered and, at a weight of more than 900 kg (1984 lbs), is comparable in size to a small car. The capsule that will be used to carry the rover into the Mars atmosphere is even larger than the Apollo capsule that housed three astronauts for missions to the Moon. ChemCam is one of 10 instrument packages contained on the rover. The other instruments are capable of identifying minerals, sniffing out organic materials, observing the weather and radiation environment, and drilling several centimeters into the Martian rocks. Curiosity is due to launch from Florida in November of 2011 and will arrive at Mars in August 2012. 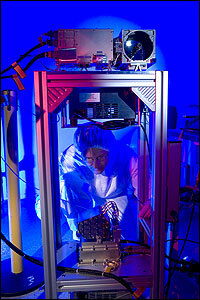 The ChemCam instrument was conceived, designed and built by a US-French team, led by Los Alamos National Laboratory in New Mexico, JPL in California, CNES and the CESR at the Observatoire Midi-Pyrénées in Toulouse.